Not only was the site cramped and tight, requiring a team of 12 specialist tradespeople to manoeuvre the removal and installation of equipment, the site had to maintain a stable temperature throughout the changeover as well. And the consequences of any missteps would not go unnoticed – phone communication for the entire Perth metropolitan area would be lost! “Working on the Telstra Priority Exchange site in Pier Street was without doubt one of the most pressure filled projects in the 15 years I’ve been at AE Smith,” says Brian Webber, Perth Projects Manager for AE Smith. Project Managed by Transfield Services, the upgrade to the Telstra Priority Exchange at Pier Street is part of the National Broadband project. Beyond the pressure of losing phone communication for the city should anything go wrong, the AE Smith team were also posed with several logistical issues adds Brian. 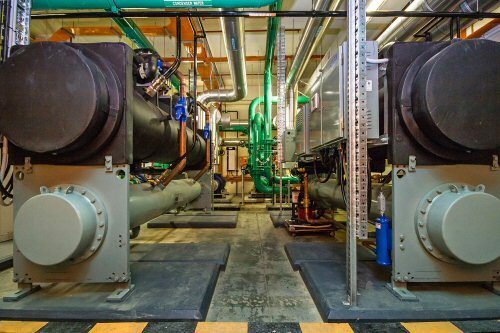 “This main critical exchange needed to have three main chillers replaced under life cycle replacement. The old Luke chillers were very inefficient in terms of power usage so the brief for high tech, high spec oil free PowerPax Chillers was used. As part of the energy savings these each had Harmonic Filters supplying the power to each new PowerPax Chiller,” explained Brian. A team of 12 were involved in the delicate operation, including builders, plumbers, controls technicians and electricians. It seems the more pressure involved with a project, the more the Perth AE Smith project team and their preferred specialist contractors thrive. There were also strict Occupational Health & Safety (OHS) checks required by Telstra the AE Smith team needed to adhere to, as well as reporting and involving offsite Telstra personnel.